01. // Kitty doll; 02.// Feelings book; 03.// Wood teether; 04. // XO game; 05. // Bead set; 06. // Gold stickers; 07. // Pink pillow; 08. // $10 art; 09. // Leather moccasins; 10. // Heart Art Print. A HOLIDAY GIFT GUIDE & GIVEAWAY WITH ETSY! GIVEAWAY NOW CLOSED - Congrats to ja_cs_ on Instagram!!! It's November!!! I know, Halloween has just finished. 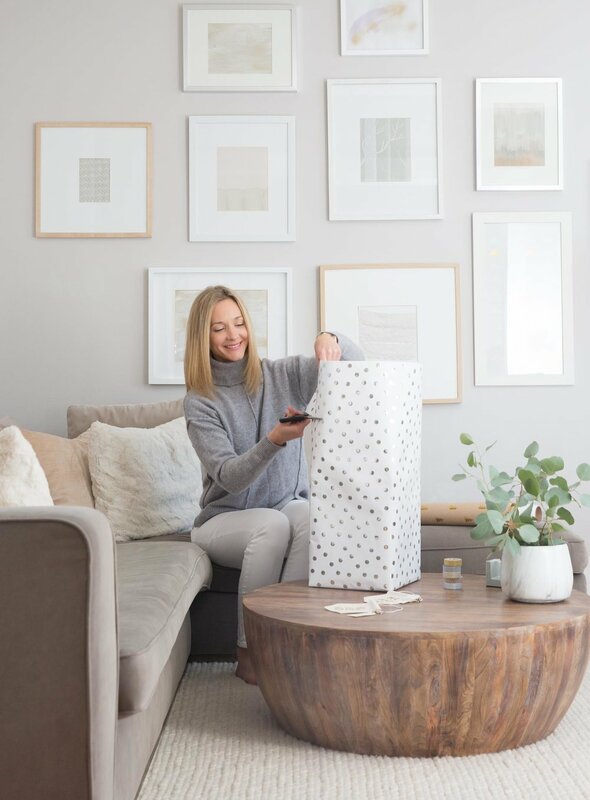 It's a little early to think about the next holiday season and to get you in the mood, I have partnered with my favourite handmade site, Etsy, to give away $100 gift certificate to spend on whatever you like on their site! Yipee!!! Head over to my Instagram, like, follow and leave me a comment here or there telling me what you'd buy if you win and you will be entered for the gift certificate. I'm sure you already know it, but in case you don't, Etsy is an online marketplace for the hand crafted and vintage. It is a site that I get lost in regularly searching for amazing handmade things that creative people make all over the world. If this sounds like your kind of thing, read on. I always hope that by getting gifts ready and wrapped early, it will allow the chance to fully enjoy the festive time with all the events December brings (Christmas train, lights shows, family events, etc.!!!). A year ago I shared my favourite garlands for kids rooms from the same site and I hope you love this selection as much as you loved that one! Giving handmade things feels a little extra special and to help you narrow down the vast number of options, I've rounded up my first gift guide of the season for the little ones in your life with 25 of my favourite gifts for kids from Etsy. 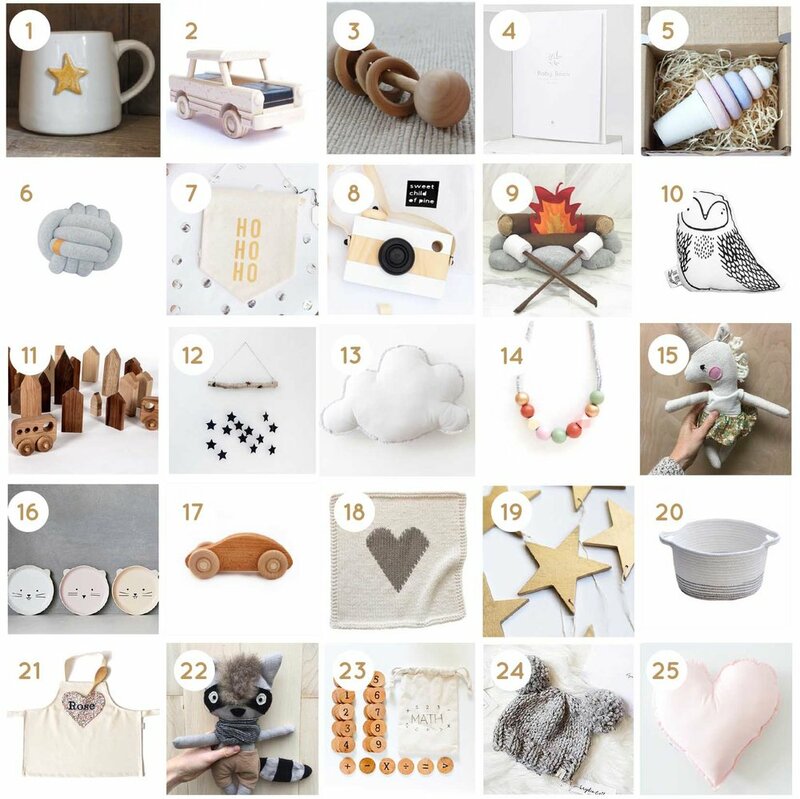 1.// Ceramic kids mug; 2.// Wood taxi car; 3.// Natural wood teether; 4.// Baby memory book; 5.// Ice cream stacker; 6.// Grey knot cushion; 7.// Mini ho ho ho banner; 8.// Wooden toy camera; 9.// Felt fire set; 10.// Owl soft toy; 11.// Wooden toy houses; 12.// Small star mobile; 13.// Grey cloud pillow; 14.// Children's bead necklace; 15.// Linen unicorn softie; 16.// Kids cat plate; 17.// Wooden toy car; 18.// Soft heart blanket; 19.// Gold star garland; 20.// Small storage bin; 21.// Personalized heart apron; 22.// Darling raccoon softie; 23.// Math learning set; 24.// Double pom hat; 25.// Pink heart pillow. Etsy has also helped to make shopping for the holiday season a little simpler by creating their own gift guide, which you can find here. Happy shopping friends! *This post and giveaway was created with Etsy. The giveaway closes on Sunday November 4th. Winner will be announced here on the blog and in my Instagram stories.